The "life-saving" practices of the U.S. Department of Homeland Security illustrate the pernicious ties between official humanitarianism and a violent regime of immigration policing and exclusion. Did you know that U.S. Customs and Border Protection (CBP) saves lives? It turns out that it is an important function of the agency—from rescuing migrants in life-threatening situations in the U.S.-Mexico borderlands to delivering humanitarian aid to earthquake-ravaged Haiti—at least according to official press releases and various media reports. CPB stages a rescue for the media. Credit: Arizona Daily Star. Yes, the same apparatus of migrant exclusion—the one, for example, that put 16 Coast Guard cutters off of Haiti’s shores in the days following the 2010 earthquake to prevent anyone from leaving the devastated country for the United States, and that continues to push unauthorized migrants into treacherous terrain and cause many to die—is also a lifesaver of sorts. Yet, while conflicting, the two functions are also complementary. Indeed, the humanitarian functions of CBP and the Department of Homeland Security (DHS) of which it is part provide useful cover for their fundamentally anti-human work, while diverting attention from the need for radical political change. 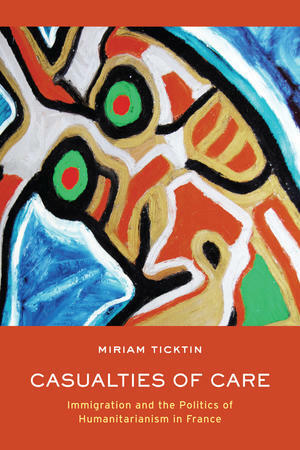 In this regard, an important and fascinating book, Casualties of Care, by anthropologist Miriam Ticktin, provides highly valuable insight. It shows how humanitarianism and political-geographical practices of exclusion by nation-states can and often do go together. Examining the case of France—particularly the humanitarian protections from deportation for migrants who are sufficiently diseased or who have been victims of sexual violen ce—Ticktin demonstrates that the exercise of compassion by officialdom, the allowing of exemptions, can serve to strengthen socio-territorial boundaries. Were the situation otherwise—if addressing the violated, the exploited, the oppressed and the suffering, for instance, were about rights in a socio-geographically expansive sense—it would involve a reworking, if not an overthrow, of the existing order as opposed to exemptions for a lucky few. For such reasons, there are severe limits to the “good” that humanitarianism can do. Historically in the realm of immigration control, the U.S. government has long deployed supposed beneficence to legitimate the draconian, a cynical practice that continues to the present. Today, for example, the federal government sets aide 5,000 “T visas” each year. They are, according to DHS, “for those who are or have been victims of human trafficking and are willing to assist law enforcement in the investigation or prosecution of acts of trafficking.” In other words, the state grants such visas to members of the very population the state helps to produce via its practices of violent exclusion. This Orwellian practice permits hospitals to put patients who are unauthorized immigrants—without consultation or their permission—on chartered international flights, often while they are still unconscious, back to their countries of origin. This is done in the name of saving money as who will pay for the patients’ care, given their undocumented status and frequent lack of health insurance, is often unclear. Several hundred individuals, it is conservatively estimated, have been forcibly disposed of in this fashion over the last five years. If such brutality speaks to the sharp numerical and financial limits of the state’s compassion, what transpired at the international boundary crossing between Nogales, Sonora and Nogales, Mexico on Monday, July 22, speaks to its profound political limits. Lizbeth Mateo, one of the nine, trying to re-enter the United States in Nogales. 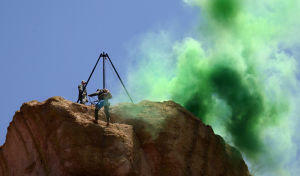 Credit: Perla Trevizo/Arizona Daily Star. On that day, nine young adults who had lived for many years in the United States without authorization tried to re-enter the country, to return home, through the official U.S. port of entry. All of them had left the United States—either to pursue educational opportunities or seek medical treatment, or to make a political statement. They asked DHS for humanitarian parole—an exemption that DHS is authorized to grant for a variety of reasons—a request that was denied. 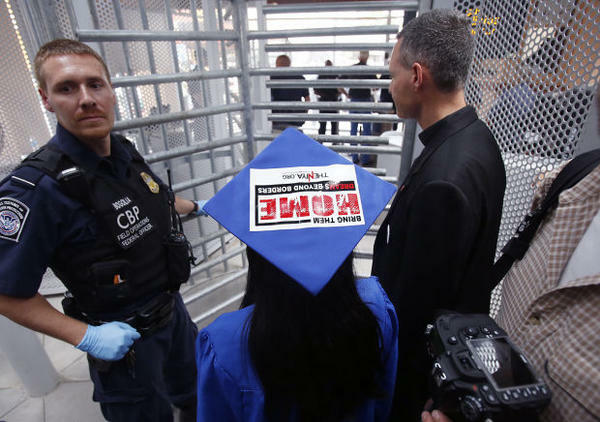 Instead, immigration officials arrested the youths and sent them to a detention center in Eloy, Arizona, where they remain as of this writing. The outcome is hardly surprising. After all, how could DHS publicly allow humanitarian exemptions for individuals who question the legitimacy of their work, who call into question the very apparatus of immigration control, ones chanting “undocumented and afraid”—part of an action broadcast live on the Internet? As the outcome of this courageous and politically vital action demonstrates, one must be highly skeptical of the supposed “life-saving” or “humanitarian” practices of the apparatus of exclusion. It illustrates the necessity of exposing how they obscure a much larger set of practices that effectively deny life to so many. After all, a wolf in sheep’s clothing is still a wolf.